Beachfront Villa Estrella de Mar offers you the Most Exclusive Five Star Resort Amenities including: Your own Private Pool, Relaxing Steam/Turkish Bath, 5 Mile Long Private Beach Access, Grocery Delivery and Chef - Meal Service upon request. Villa Estrella de Mar is Located in Paraiso del Mar Resort on 'El Mogote Peninsula which is just a 5 Minute Ferry Ride from Marina Cortez located Downtown at the Waterfront Boardwalk of the City of La Paz. Ferry and Resort VAN Transportation Services are provided by Paraiso del Mar Resort and are included in your rent. • 2 (Two) Master Suite Bedrooms each with a king size bed, sofa bed, private bathroom with his/hers lavatories, bathtub, shower and walking closets. • 1 (Third) Bedroom comes with 1 Queen Size Bed and a Full Bathroom. • 1 (Fourth) Guest Bedroom Casita with a Full Bathroom and 2 Twin Size Beds that can be converted to One King Size Bed. • Books and Games which are available for your use. • Reverse Osmosis Drinking Water in Kitchen and Ice Making Refrigerator. Paraiso del Mar Resort & Development consists of nearly 1700 Acres, with over 800 acres that have been set aside for wildlife sanctuaries, mangrove reserves and has become an Eco-Friendly Biological Corridor. Villa Estrella de Mar is Particularly Well Suited for Family and/or Friends Reunions, Weddings or any other kind of Events. Master Bathrooms with his/hers lavatories, vanity, Shower, Tub and Walk-in Closet. All Bathrooms have Marble Countertops, beautifully decorated and were hand Wash-Painted by a Local Artist. Beachfront Private Pool with Swim-up Bar and Solarium. 3 Hours Gas Heating on Jacuzzi Tub available for $30 per day - On Request to Owner/Manager, otherwise Same Pool Temperature. For Weddings, Family Reunions or Private Events please contact Owner, Manger or Concierge. Our family 8 stayed at the casa for a week. It was exactly as advertised. It was spotlessly clean. Plenty of water toys. We really appreciated the housekeeper , Martha and concierge Ruben. Martha made us two delicious dinners and 1 breakfast, with plenty of leftovers. Ruben took care of all our requests . He arranged whale watching and a trip to Todos Santos. I particularly enjoyed the steam room. No problem bringing lots of clothes , the washer/ dryer was a plus. We also ate at the condo pool restaurant.The only thing that brought my rating down from a 5 was $32.00 for 4 hrs of jacuzzi time I didn’t plan on. The home is exactly as shown in the pictures. The location is perfect. On a sand beach, in high-end resort community. Getting into La Paz city is easy—the community provides a free ferry that only takes 10 minutes (literally), and runs every half hour. There’s also free transportation to the ferry, a 5 minute van ride on demand at any time. They were always on time as requested. The home itself appeared to be the best in the area, with a large pool, swim-up bar, hot tub, and private sand backyard. Martha’s meals are delicious, we highly recommend dinner and breakfast on arrival. If you’re looking for amenities, safety, easy access into the heart of La Paz, and a warm welcome, this is the place for you. Wonderful family get away at this beautiful beachfront casa!!! Thank you, thank you, Humberto, for all your help in planning our stay at Villa Estrella de Mar, Oct. 14-20. The casa was beautiful and it was a wonderful place to spend time together as a family! We all agreed we would love to return some lovely day!! Please, please know that we are tremendously grateful for your excellent, kind service and have a true appreciation for the beautiful property you provided for our family!! The home was gorgeous and your warm, helpful, flexible expertise was absolutely wonderful!! Many thanks from our familia to you & yours!! Look forward to booking with you again some beautiful day!! We stayed there for 5 days and the owner Humberto , the concierge Ruben and Martha always did everything possible to make our stay the best ever. The house is in a wonderful location. Martha is always willing to help beyond our expectations. She kept the house very clean. We had no issues at all , we definitely recommend this property 100%, service , clean, location , space , etc. Amazing House in an amazing location !!! Words can not describe how amazing this location is. The island is so peaceful. We stayed for a week in August and we had the whole beach to ourselves. The ocean is so calm; it is perfect for little kids. The water is very clean and the shore is quite shallow for quite aways in., making it very safe for kids. We went on a snorkeling excursion that was incredible. The waters are co crystal clear and the marine life is like swimming in an aquarium. The house has a great floor plan with 2 master suites and 2 additional bedrooms. The backyard has everything you could want, swim up bar, jacuzzi, steam room, outdoor bathroom and shower, hammock, 2 large tables. The ocean is about 50 yards from the house. The house has 2 paddle boards and a few kayaks available in the garage. They have life jackets, sand toys, and beach chairs. The ferry to the peninsula is very prompt, easy to use, and clean nice boat. Martha, the housekeeper and cook, is truly a gem. She made us a delicious welcome dinner when we arrived and breakfast the next morning. She is an excellent cook and has a very warm personality. She made our group breakfast burritos for the week and they were excellent. Ruben, the concierge, was very helpful in arranging our excursions for us and all transportation to and form the airport. The owner Humberto was also extremely helpful. All 3 of them are available by phone at all times. My kids loved it and my husband and I loved it. Really don't have one bad thing to say about it. We want to thank you on taking the time to write this review as well as your kind comments in regards of our accommodations and services provided our dedicated Staff including: Check-In & Check-Out, Maintenance, Cleaning, Cooking and Concierge Services. They all want to thank you as well and I want to inform you that their professionalism is key to consistently provide an excellent and efficient service to all our guests. We hope you visit us again soon! 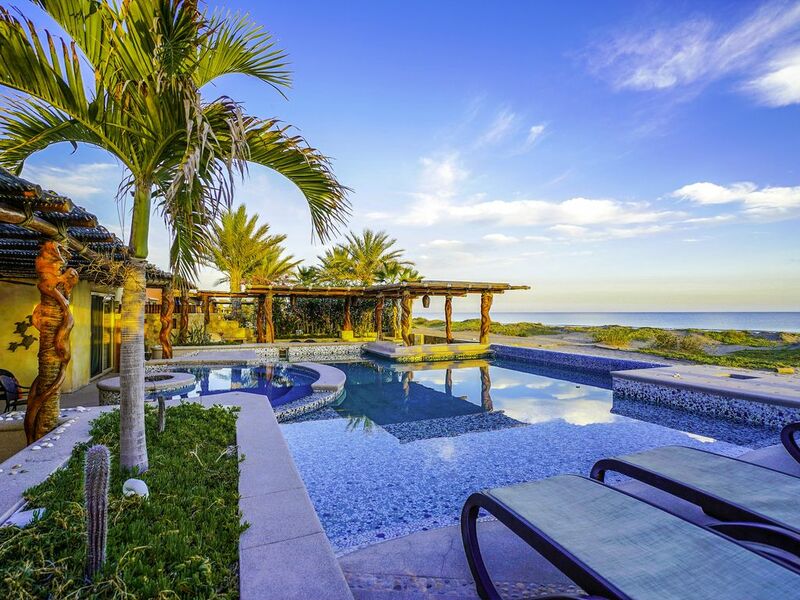 Villa Estrella de Mar is Located in Paraiso del Mar Resort on 'El Mogote Peninsula' just a 10 Minute Boat Ride from the Malecon (Waterfront Boardwalk) of the City of La Paz which makes the best place for Family and/or Friends Reunions. Paraiso del Mar Resort & Development consists of nearly 1700 Acres, with over 800 acres that have been set aside for wildlife sanctuaries, mangrove preserves and has become an Eco-Friendly Biological Corridor.